Cheesesteaks, hoagies, soft pretzels, water ice, scrapple, pork roll—the list of famous Philly foods is endless. So when you come to Philadelphia for the NASFA 2018 Annual Conference & Expo, be prepared to eat your way across the city! Philadelphia is home to thousands of restaurants specializing in a wide variety of cuisines, so whether you are looking for some local fare or have an international palette, you will be sure to find a great meal here. Time for a history lesson! In the colonial era of America, Philadelphia was dominated by taverns offering a communal atmosphere and serving affordable food and drinks to every class of worker. The 17th and 18th centuries brought the arrival of German immigrants to Philadelphia who fled turmoil in Europe surrounding the 30 Years War and its aftermath. This group came to be known as the Pennsylvania Dutch and introduced various meats and soft pretzels to the Philadelphia diet. In the late 1800s, Philadelphia saw a large increase in Italian immigrants who settled in South Philly. The Italian community heavily influenced Philadelphia cuisine, most notably by introducing the fresh Italian bread needed for cheesesteaks and hoagies. 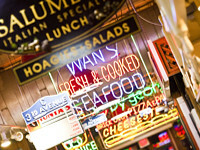 Other notable groups include Irish immigrants who settled throughout Philadelphia and its suburbs, bringing “Irish potatoes,” a bite-sized ball of confectioner’s sugar and coconut rolled in cocoa powder, and Chinese immigrants, who have their own culinary section of the city, which is conveniently located right next to the convention center! There is a lot of debate about the origin of the cheesesteak and which restaurant in Philly does it best. The most widely known origin story involves brothers Pat and Harry Olivieri, who ran a hot dog stand in the 1930s. One day after putting grilled beef on a hot dog bun and selling it to a taxi driver, word spread about this delicious new sandwich and Pat’s King of Steaks was born. There is a famous long-standing rivalry in South Philadelphia, over which restaurant makes the best cheesesteak, Pat’s King of Steaks or Geno’s Steaks. Most locals are fiercely loyal to one or the other, or they prefer another place like Jim’s Steaks. Either way you can’t go wrong with a Philly cheesesteak. Check out these top 10 places to try authentic Philly cheesesteaks. Hoagies are made on fresh Italian rolls and stuffed with your choice of meat, cheese, and veggies. Also known as “subs,” “grinders,” “heroes,” and “blimpies” in other parts of the United States, hoagies are available in sandwich shops across the Philadelphia region, but locals know that the gas station and convenience store chain Wawa makes the best made-to-order hoagies. Water ice, also known as “Italian ice,” is a must-have summer treat. Water ice has a unique consistency that is softer than a snow cone, but harder than a 7-11 Slurpee. Water ice comes in many different flavors and is eaten with a spoon. Locals line up outside of Rita’s Water Ice, a popular chain found throughout the mid-Atlantic region. Scrapple is a Pennsylvania Dutch specialty made from the trimmings of meat that have been pressed into a patty with herbs and spices. It is usually eaten as a side dish for breakfast. Pork roll is another breakfast specialty that is also known as “Taylor ham” in New York and parts of North Jersey. Pork roll is ham that is thinly sliced to fit sandwiches and bagels. There are many amazing restaurants and places to eat in Philadelphia, but there are a few standout places around the Convention Center. Bordering the Convention Center, you will find just about any Chinese specialty you can imagine. I recommend checking out Dim Sum Garden for amazing dumplings or Tom’s Dim Sum for noodles. A large indoor European-style market with different stalls serving everything from gyros to funnel cakes. An absolute must-visit, steps away from the Convention Center. A few blocks further from the Convention Center you will find great Vietnamese food such as Pho 20. I also recommend trying some of Philadelphia’s Middle Eastern cuisine, like The Halal Guys, a chain serving rotisserie meats paired with flavorful rices and delicious hummus. There is also a Panera Bread, Burgerfi, and Chili’s outside of the Convention Center for those searching for American food.